* Often times we are interested in estimating the effect of a binary endogenous regressor on a binary outcome variable. * It is not obvious how to simulate data that will fit the criteria specifications that we desire. * First let's think about the standard IV setup. * With u and v distributed normally and independently of x, w, and z. * We know this setup is generally not correct if either y is binary or w is binary . * However, it is not easy to generate data in this form. * Instead we will generate data introducing endogeneity by use of an unobserved addative error. label var z "Exogenous instrument"
label var v "Unobserved error"
label var wp "Endogenous variable"
* The above equation should not be expected to estimate a coefficient of 1.25 on the z variable. * Thus, when the probit estimator is run it automatically scales the equation to be unit. * We can discover consistent estimator by rescaling the coefficient on z to the true standard deviation. di -.5/(2^.5) " for the constant"
di 1.25/(2^.5) " for the coefficient on z"
label var x1 "Exogenous variable"
* Pretty close estimates to what we expect. * Now we are including the v term in the generation of y in order to introduce an endogenous correlation between w and y. * We need to adjust our estimated coefficients. * First let's see what happens if we neglect to make any effort at controlling for the endogeneity. * In order to estimate our relationship in a consistent manner we will use the biprobit command. * This command effectively estimates two separate probit regressions with the allowance that the unobserved outcomes be correlated with the parameter /athrho. * In this case, the unobserved component from the w estimation equation is the endogenous component from the y estimation equation. * Since, w only is entering y linearly it is sufficient that the unobserved portion of w correlated with y is in a sense controlled for through the joint probit regression. * We can test the "endogeneity" of w by testing the significance of /athrho. Which appears in this case to be quite significant. 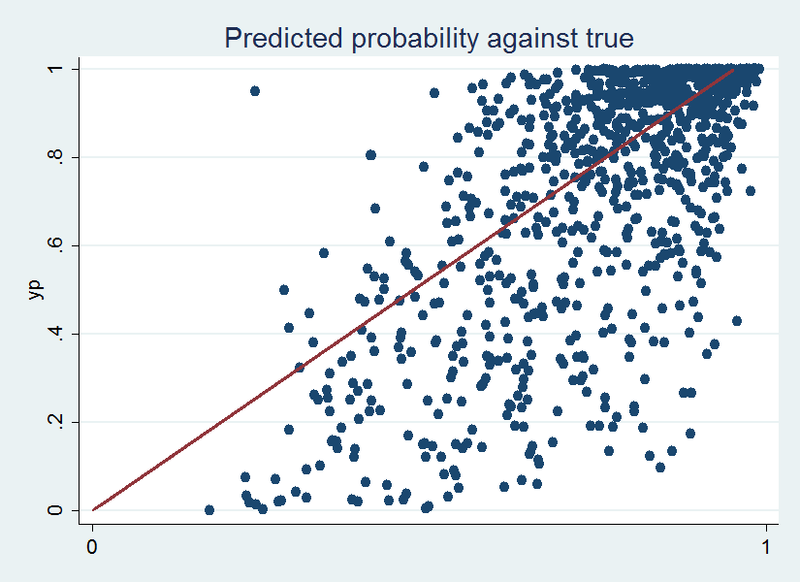 * Not bad, we fail to reject there being any difference between our estimate of the coefficient on w and the true. * This is working well though with 1,000 observations. It seemed to be extremely ineffective with 100 observations however. * What do we do if there are multiple endogenous binary variables? label var w1 "Endogenous variable 1"
label var w2 "Endogenous variable 2"
* The majority of estimates are not working well. * Previously the biprobit was sufficient. However, biprobit only allow for a two-way probit. * Fortunately, there is a user written command that uses simulation to approximate a multivariate probit. * install mvprobit if not yet installed. * Unfortunately the estimates are still too far away from the true. * However, they are closer. 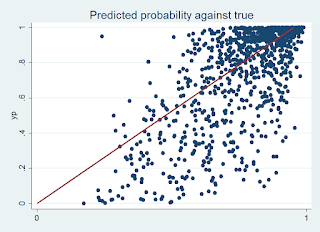 * Let's see how the fitted probability line compares with the true. * Overall, not a bad fit. * This might not be sufficient for many applications. * What happens when one of the endogenous variables is continuous?